The papers are split on their treatment of the latest make or break day of Brexit drama in parliament with Conservative-supporting titles trumpeting the Commons deal as a success for Theresa May. But the Guardian, FT and Mirror emphasise the problem May faces in negotiations with the EU, which has said that the Irish backstop is part of the withdrawal agreement and cannot be undone. 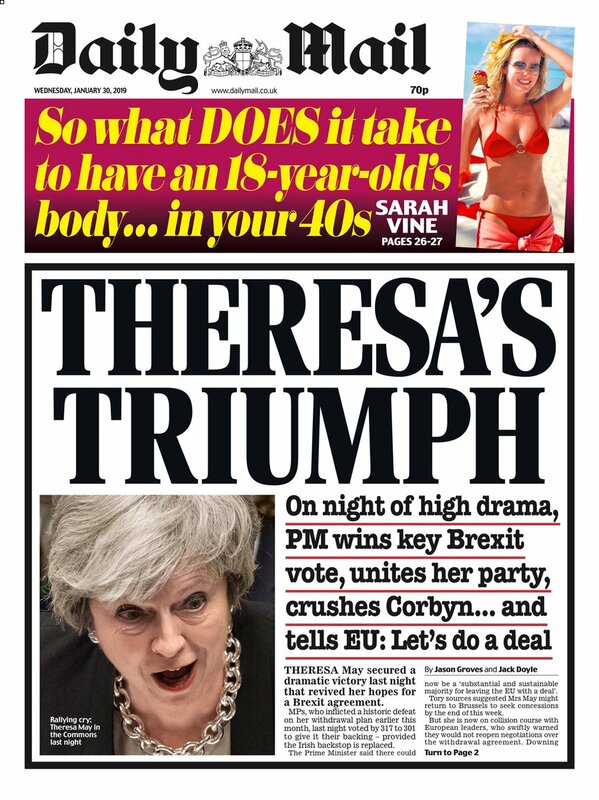 The Mail’s treatment is typical of the more pro-Tory front pages and calls it “Theresa’s triumph” as the PM “revived her hopes for a Brexit agreement”. The paper also notes that she “crushed” Jeremy Corbyn by seeing off a Labour amendment to win a vote on its Brexit policy. The Express is even more convinced that the outcome of the votes represent a significant change in fortunes for the embattled PM weeks after she suffered a humiliating Commons defeat on her Brexit deal. “She did it!”, the paper screams, describing May as our “indomitable PM” who has achieved “one of the most remarkable turnarounds in political history”. The Sun declares “Backstop from the brink” in its splash headline. It says Theresa May now has the “wind in her sails” to go back to Brussels and demand changes to the Irish backstop. It was a double triumph, the paper says, because she also managed to defeat Yvette Cooper’s amendment to delay Brexit. It also reports that May has completely caved in to hardliners in her own party by agreeing to shakeup her Brexit negotiating team. She will now include Julian Braithwaite, the UK’s permanent representative to the UN and WTO in Geneva, and Crawford Falconer, the chief trade negotiation adviser at the Department for International Trade. 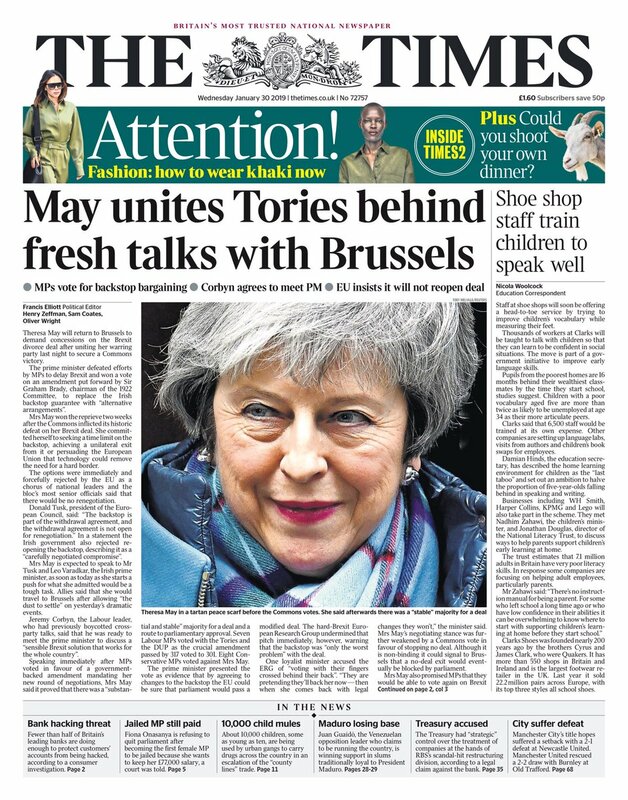 The Times is more measured and says that the PM has united the Conservative party around a potential new deal – but warns that EU might not be in the mood to budge. 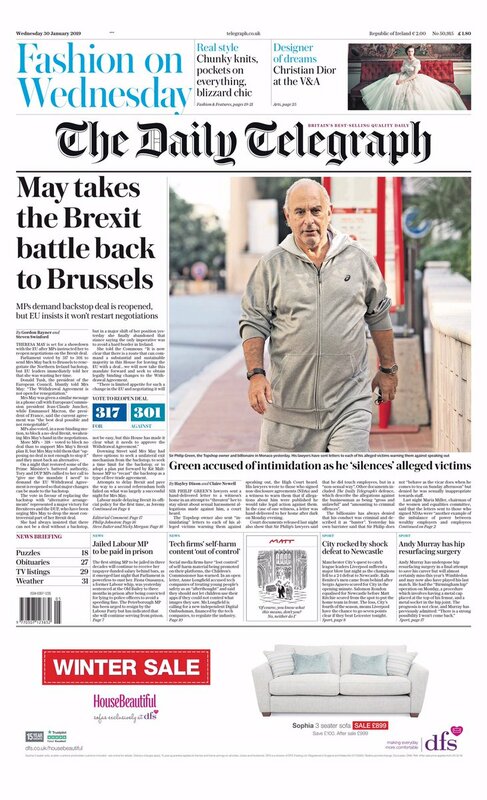 The Telegraph also shapes its story with the prime minister on the offensive and runs the headline saying “May takes the Brexit battle back to Brussels”. 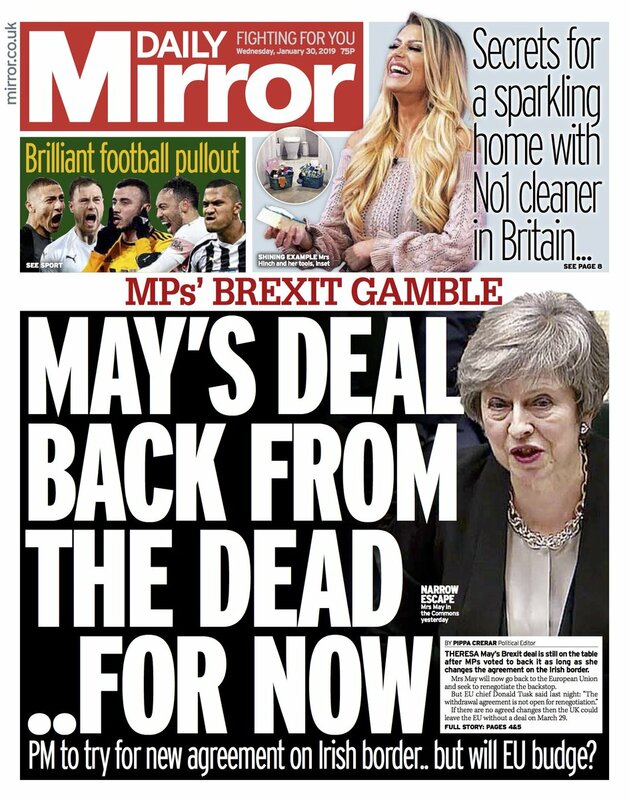 And the Mirror says “May’s deal back from the dead … for now” but notes that if there are no changes forthcoming from the EU then Britain will be leaving with no deal on 29 March. The Scotsman says “May wins backing of MPs for last-ditch Brussels push”, while the Independent plays on the time difference between the Commons vote and the EU slapping it down. 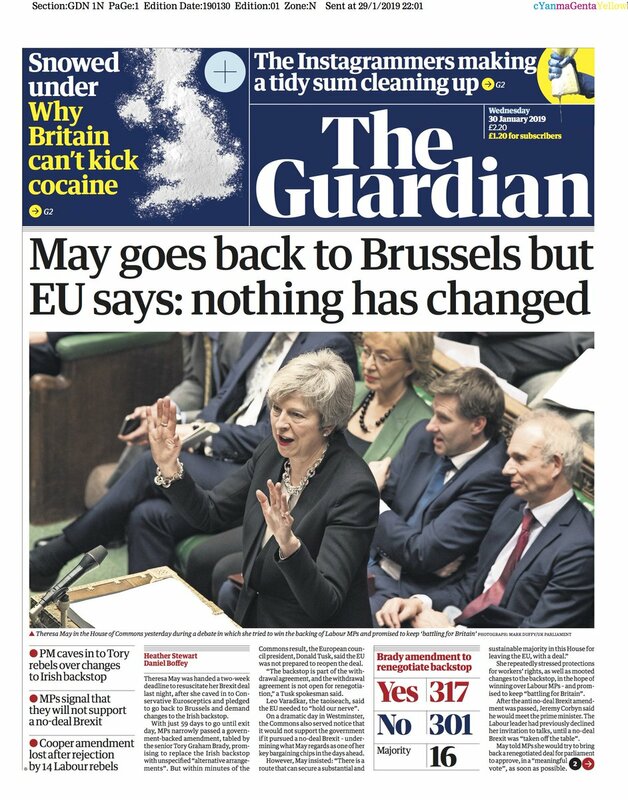 “8.41pm MPs send May back to Brussels for a new deal, 8.47pm Brussels says no,” runs its headline.